Osteitis deformans, also known as Paget's disease, is characterized by accelerated osteoclastic activity followed by ineffective osteoblastic activity resulting in a deformed and fragile bone. It is more prevalent in Western Europe and relatively rare in Eastern Asia. It predominantly involves the lumbar spine, pelvis, and femur, frequently as polyostotic and rarely as monostotic disease. Here, we report a 64-year-old female, who presented with severe progressive back pain with no neurological symptoms. Radiographs revealed a picture frame L1 vertebra which was deformed and enlarged with loss of normal alignment. Magnetic resonance imaging revealed bone marrow changes involving all columns of L1 vertebra. Whole-body technetium-99 bone scan showed a solitary increased uptake of radioisotope by L1 vertebra. Considering the possibility of metastatic tumors, blood investigations were drawn for tumor markers which were within normal limits. A computed tomography-guided biopsy was done to facilitate diagnosis. Histopathology sections showed a mosaic pattern of bony trabeculae with multinucleated osteoclasts causing erosions and tunneling. A diagnosis of monostotic Paget's disease was made which satisfactorily responded to single-dose zoledronic acid treatment. A comprehensive literature review is provided. Osteitis deformans (Paget's disease of the bone) was first described as a chronic inflammation of the bone by Sir James Paget in 1877. Literature regarding its etiology primarily associates the disease to viral antigens, chromosomal translocations, and environmental factors but lacks substantial evidence., Pathogenesis of the disease is characterized by accelerated osteoclastic activity followed by ineffective and chaotic osteoblastic activity resulting in a poorly mineralized and deformed bone that is highly vascular. Presentation of the disease is frequently polyostotic and rarely monostotic. Predominantly affected skeletal sites include the lumbar spine, pelvis, and femur that contribute to the majority of diagnosed cases. Due to its sporadic nature in Eastern Asia, not many cases are reported. Some cases are misdiagnosed and some end up with surgical resection as mainstay management, both of which can be avoided by understanding the disease. Hence, it is of great value to report our case of monostotic Paget's disease involving the lumbar vertebra that was effectively managed by conservative modalities. A 64-year-old female was encountered with complaints of intermittent low back pain for 6 months which progressed and become severe that affected her daily routine, for which she sought intervention lately. Pain was the only predominant symptom which was localized to the lumbar region of the back. It usually was aggravated on movement and relieved by rest. There was no diurnal variation of pain neither was nocturnal pain nor morning stiffness. She did not have any known underlying chronic illness. Examination revealed a palpable midline tenderness corresponding to L1–L2 segments. Numeric rating scale (NRS) pain score was 7. Special tests for eliciting sciatic pain were negative, and neurological status was normal. Conventional anteroposterior and lateral view radiographs showed a thickened cortex and a relatively lucent center resembling a “picture frame” L1 vertebra [Figure 1]. Dimensions of the vertebral body appeared to be altered, and normal vertebral alignment was lost. Computed tomography (CT) revealed trabecular coarsening giving appearance of thickened cortex and occasional lysis in the vertebral body. 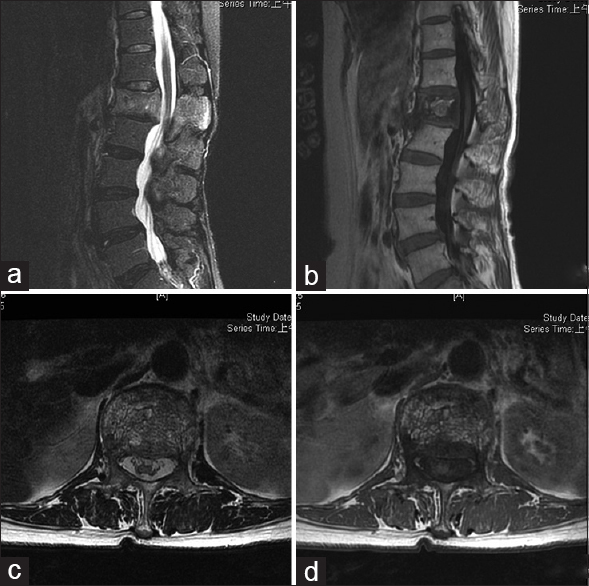 Gadolinium-enhanced magnetic resonance imaging (MRI) was suggestive of bone marrow changes involving the vertebral body and also the posterior elements [Figure 2]. 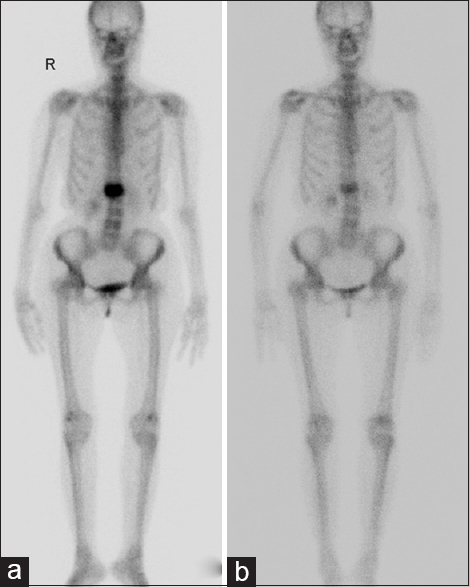 A whole-body technetium-99 bone scan showed increased uptake of the radioisotope by L1 vertebra and no other lesion elsewhere [Figure 3]. Considering the radiological appearance, osteitis deformans (Paget's disease) is a possibility, yet metastatic tumors need to be ruled out. Hence, blood investigations were drawn to look for tumor markers (CA15-3, CEA, SCC, and CA-125) which were within normal limits. Serum alkaline phosphatase level (ALP) was in the upper limit of normal (92 U/L). A CT-guided biopsy was done to make a definite diagnosis. Histopathology sections revealed woven bone with irregular disorganized broad trabeculae forming a mosaic pattern. Characteristic presence of multinucleated (more in number than typical) osteoclasts causing erosions and tunneling was also noticed [Figure 4]. A complete scenario of monostotic Paget's disease was evident, and conservative management was planned. Single intravenous dose of 5 mg zoledronic acid was used as definitive management. Appropriate rehabilitation protocols were provided. The patient tolerated the bisphosphonate well with no complications. Symptomatic improvement by decrease in the severity and frequency of painful episodes was noted 1 week following therapy. NRS pain score decreased to 2. Serum ALP levels remained normal throughout follow-up. Response to zoledronic acid was confirmed by decrease in radioisotope uptake as seen in technetium-99 bone scan which was repeated after 6 months. The patient was followed up for a duration of 24 months, and there was no clinical recurrence during the entire follow-up period. Osteitis deformans is unanimously agreed to be a Western disease. However, rarely, cases are reported from Eastern Asia including countries such as Taiwan, Japan, and Korea., Pelvis and lumbar spine are the most commonly affected sites in both polyostotic and monostotic variety. Monostotic variety can be asymptomatic for a long duration before the first symptom breaks out. Symptoms of monostotic vertebral Paget's disease may be due to the fragile bone itself or occur as a result of compression to the surrounding structures caused by the expanding bone. In case of vertebral Paget's, neurologic dysfunction is the most debilitating presentation. However, it occurs only in the late stages of the disease, and pain can be the predominant symptom as seen in our patient. Serum alkaline phosphatase is often elevated in active Paget's disease and is the only cost-effective modality to assess bone formation. Sometimes, it may not be elevated, especially in case of monostotic Paget's disease. Early stage radiographs often show a typical appearance of a “picture frame” vertebra. This phenomenon is due to subchondral condensation of trabecular bone that gives a false impression of thickened cortices along with a relatively lucent center due to resorption. The same is well appreciated in axial CT sections. Bone scintigraphy can effectively show the extent of involvement of the disease which clearly gave a monostotic picture in our patient. MRI often gives a heterogeneous picture resembling a tumor and hence needs to be correlated with other investigations. Histopathological appearance as seen in our patient is definitive for diagnosis. Considering all investigatory parameters, appropriate management can be planned. If neurologic compromise is dawning, then decompression surgery is recommended. Medical management of the underlying disease is the key to better prognosis. Various treatment protocols are described in literature, but we chose to use single-dose zoledronic acid considering its availability and cost-effectiveness. Zoledronic acid is proved to have an adequate therapeutic response that brings rapid reduction in bone turnover and considered as first-line treatment for Paget's disease. Studies show that early therapeutic response of zoledronic acid remains sustained even after 18 months follow-up. Suspecting osteitis deformans (Paget's disease of the bone) in the spine is essential when typical radiological imaging characteristics favor certainty. Further investigating with a biopsy is essential to come to a definitive diagnosis, mainly to avoid unnecessary surgery. This disease can be efficiently managed by bisphosphonates such as zoledronic acid that leads to a better clinical outcome and prognosis. Paget J. On a form of chronic inflammation of bones (osteitis deformans). Med Chir Trans 1877;60:37-64. Reddy SV. Etiology of Paget's disease and osteoclast abnormalities. J Cell Biochem 2004;93:688-96. Shaker JL. 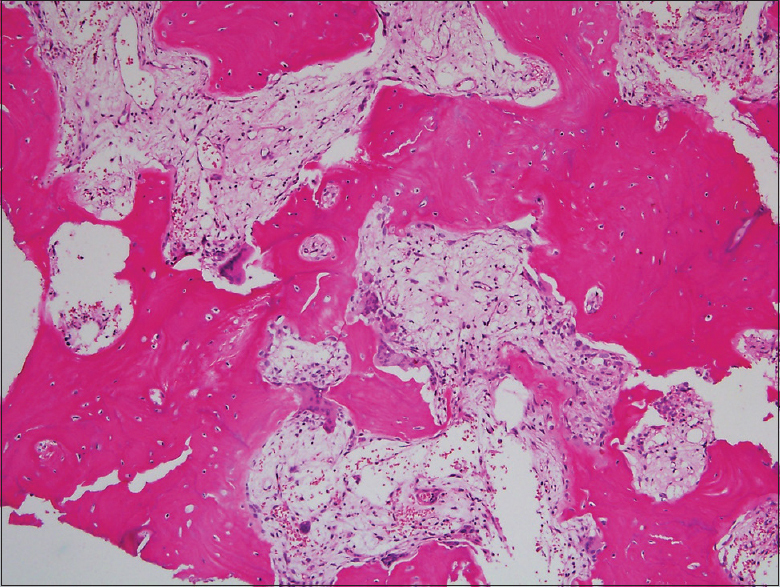 Paget's disease of bone: A review of epidemiology, pathophysiology and management. Ther Adv Musculoskelet Dis 2009;1:107-25. Wu LC, Tseng CH, Chiang YF, Tsuang YH. 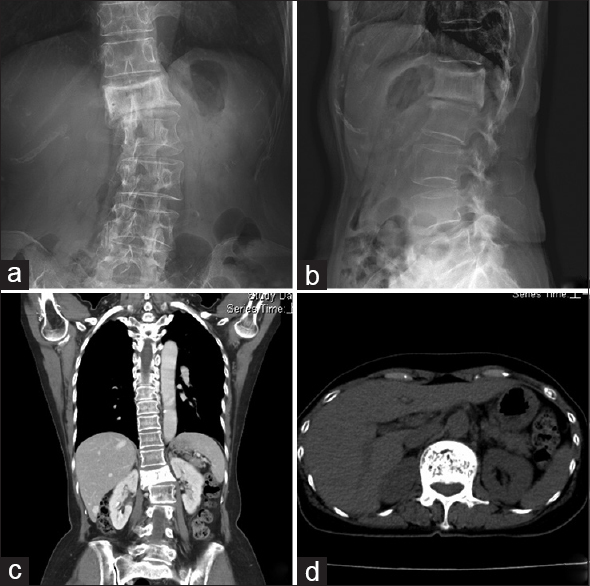 Monostotic vertebral Paget's disease of the lumbar spine. J Chin Med Assoc 2009;72:52-5. Hoshiro M, Harada T, Iwai H, Miyatake T, Nishimura A, Ohno Y, et al. Two cases of monostotic Paget's disease: Effects of bisphosphonate. Endocr J 2003;50:385-92. Ooi CG, Fraser WD. Paget's disease of bone. Postgrad Med J 1997;73:69-74. Poncelet A. The neurologic complications of Paget's disease. J Bone Miner Res 1999;14 Suppl 2:88-91. Bertoldi I, Cantarini L, Filippou G, Frediani B. Paget's disease. Reumatismo 2014;66:171-83. Dell'Atti C, Cassar-Pullicino VN, Lalam RK, Tins BJ, Tyrrell PN. The spine in Paget's disease. Skeletal Radiol 2007;36:609-26. Keating GM, Scott LJ. Zoledronic acid: A review of its use in the treatment of Paget's disease of bone. Drugs 2007;67:793-804.